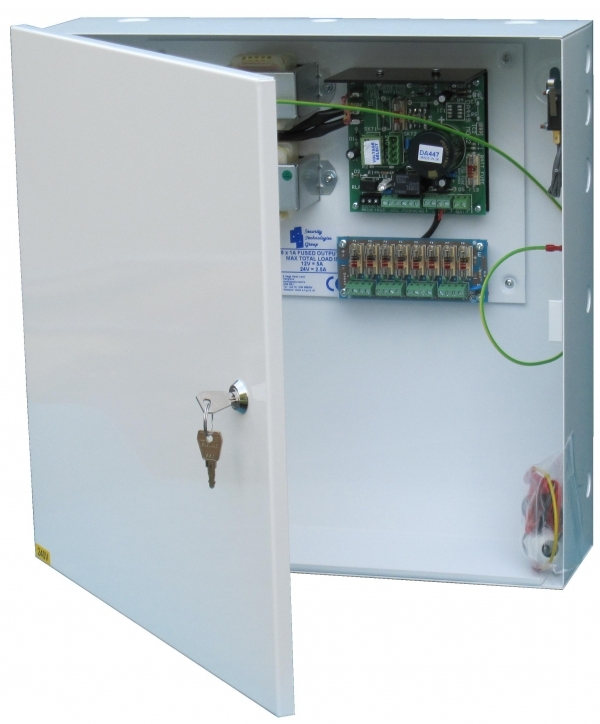 STG have developed a range of specialist Power Supply Units specifically designed to meet the exacting demands of the Access Control industry. You will be able to find cheaper general power supplies but you will not find better thought out products with ease of installation suitability at their core. PSU12V1.5A8OC 12Volt @ 1.5Amp/24Volt @0.75Amp Power Supply Unit with Battery Back up, hinged lid, tamper switch and lockable enclosure designed specifically for Access Control applications. Description - A power supply that will provide either 1.5 Amp 12V DC (13.7) or 0.75 Amp 24V DC (27.4). The output voltage is changed by means of a simple selector plug. The Unit provides two separate outputs, one maintained and the other switched, typically via a Fire Alarm Panel. The maintained output typically supplies the access control panel, whilst the switched will power the locks so that if the fire alarm is activated, all the power to the locks is dropped, thus allowing free egress. The PSU houses and charges two 12V 7Ah, or one 12V 12Ah or one 12V 17Ah VRLA batteries. The unit has separate SPCO (Single Pole Change Over) contacts for "Mains Fail” monitoring. 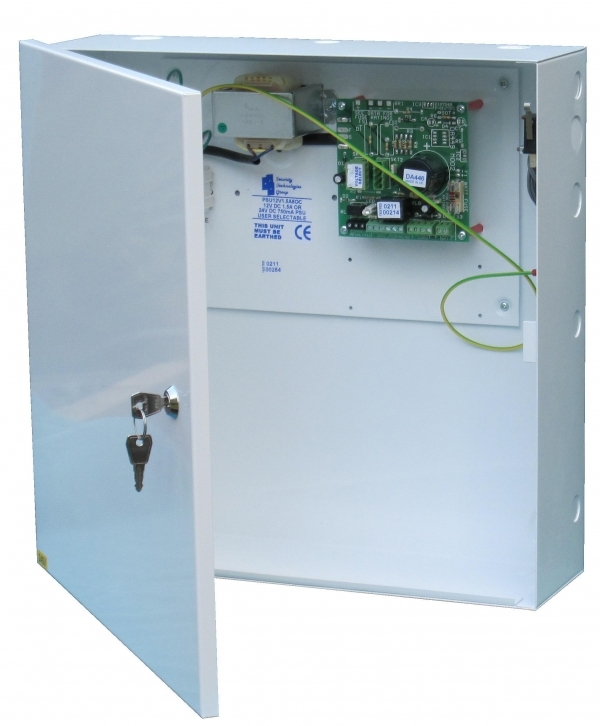 Enclosure includes a hinged lid, tamper switch and lock. Output Voltage (Selectable): 12Vdc or 24Vdc. Output Current: 1.5Amp @ 12V or 0.75Amp @ 24V. Output Configuration: 1 x Maintained for powering Access Control Panel and 1 x switched (via fire alarm panel) outputs to power lock. Case Material: 1.2 mm Powder Coated (white) Mild Steel. External Dimensions: 406mm x 410mm x 122mm. To purchase this Power Supply Unit online please click here and you will be redirected to our affiliate company e-commerce site. For a full specification please click the link below. PSU12V3A8OC 12Volt @ 3 Amp/24Volt @ 1.5 Amp Power Supply Unit with Battery Back up, hinged lid, tamper switch and lockable enclosure designed specifically for Access Control applications. Description - A 3 Amp 12V (13.7) or 1.5 Amp 24V DC(27.4) PSU with 2 separate outputs designed specifically for Access Control applications. The output voltage is changed by means of a simple selector plug. The Unit provides two separate outputs, one maintained and the other switched, typically via a Fire Alarm Panel. The maintained output typically supplies the access control panel, whilst the switched will power the locks so that if the fire alarm is activated, all the power to the locks is dropped, thus allowing free egress. The switched output has a fuse board with 8 individually fused outputs therefore ensuring that should a fault occur at any lock, only that circuit will be disabled whilst all other lock outputs will remain active. The PSU houses and charges two 12V 7Ah, or one 12V 12Ah or one 12V 17Ah VRLA batteries. The unit has separate SPCO (Single Pole Change Over) contacts for "Mains Fail” monitoring. Enclosure includes a hinged lid, tamper switch and lock. Output Current: 3Amp @ 12V or 1.5Amp @ 24V. Output Configuration: 1 x Maintained for powering Access Control Panel and 1 x switched (via fire alarm panel) through 8 individually fused outputs to power locks. PSU12V5A8OC 12Volt @ 5 Amp/24Volt @ 2.5 Amp Power Supply Unit with Battery Back up, hinged lid, tamper switch and lockable enclosure designed specifically for Access Control applications. Description - A 5 Amp 12V (13.7) or 2.5 Amp 24V DC(27.4) PSU with 2 separate outputs designed specifically for Access Control applications. The output voltage is changed by means of a simple selector plug. The Unit provides two separate outputs, one maintained and the other switched, typically via a Fire Alarm Panel. The maintained output typically supplies the access control panel, whilst the switched will power the locks so that if the fire alarm is activated, all the power to the locks is dropped, thus allowing free egress. The switched output has a fuse board with 8 individually fused outputs therefore ensuring that should a fault occur at any lock, only that circuit will be disabled whilst all other lock outputs will remain active. The PSU houses and charges two 12V 7Ah, or one 12V 12Ah or one 12V 17Ah VRLA batteries. The unit has separate SPCO (Single Pole Change Over) contacts for "Mains Fail” monitoring. Enclosure includes a hinged lid, tamper switch and lock. Output Current: 5Amp @ 12V or 2.5Amp @ 24V. PSU12V3A8OC 12Volt @ 8 Amp Power Supply Unit with Battery Back up , hinged lid, tamper switch and lockable enclosure designed specifically for Access Control applications. Description - An 8 Amp 12V (13.7) PSU with 2 separate outputs designed specifically for Access Control applications. The Unit contains two separate outputs PCB’s, one maintained output and the other switched, typically via a Fire Alarm Panel. 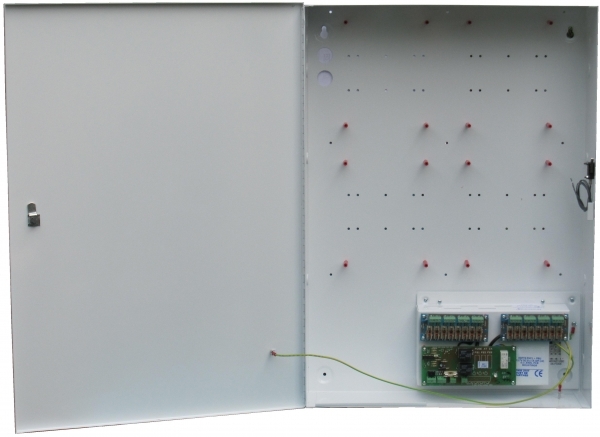 One output PCB is permanently active and provides 8 x 1A individually fused connections that typically supply the access control panels. The second output PCB also has 8 x 1A individually fused connections, but is user selectable by applying a low current 12V DC feed to the "Fire Enable” terminal on the PCB. This switched output will power the locks so that if the fire alarm is activated all the power to the locks is dropped thus allowing free egress. The PSU houses and charges two 12V 7Ah, or one 12V 12Ah or one 12V 17Ah VRLA batteries. The unit has separate SPCO (Single Pole Change Over) contacts for "Low Volts” and "Mains Fail” monitoring and includes Battery Deep Discharge Protection. Enclosure includes a hinged lid, tamper switch and lock. Output Current: 8Amp @ 12V. Output Configuration: 1 x Maintained for powering Access Control Panels and 1 x switched (via fire alarm panel) both through 2 x 8 individually fused outputs . Additional features: Mains Fail & Low voltage contacts and battery disconnect to ensure unit damage by deep discharge. 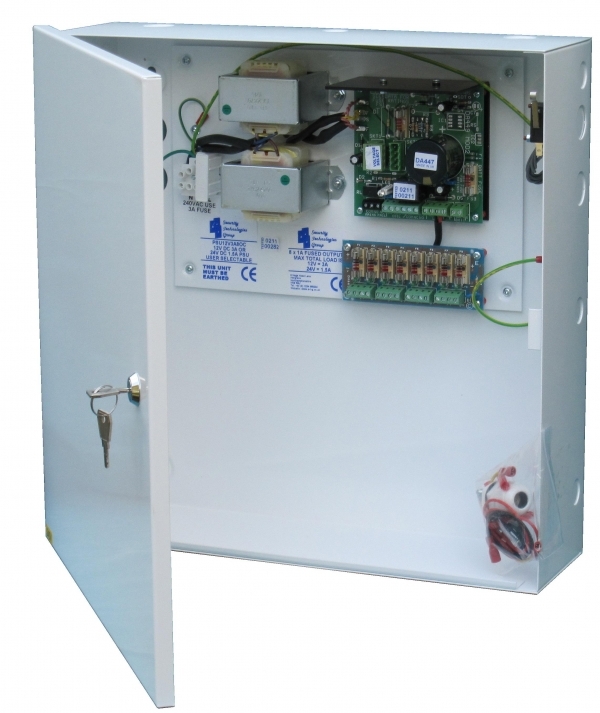 PSUSTG4MB 12Volt @ 8 Amp Power Supply Unit with Battery Back up , hinged lid, tamper switch and lockable enclosure designed specifically for mounting and supplying a variety of Access Control Panels. Description - An 8 Amp 12V (13.7) PSU with 2 separate outputs designed specifically for Access Control applications. This unit has been designed to mount 4 "Mercury Panels”. OEM’s using these panels include: Lenel, Honeywell, RS2 Technologies, Open Options, Keri Systems, Identicard, Arinc, Imron, DvTel, MDI Systems, Synergistics, ID Group, ICX DAQ and Maxxess. Additionally the PSU can be supplied with a blank mounting plate on which can be mounted panels from other manufacturers such as Paxton. The 8 individually fused maintained outputs are used to power the panels, whilst the 8 individually fused switched outputs are used to supply the locks. External Dimensions: 720mm x 510mm x 122mm. 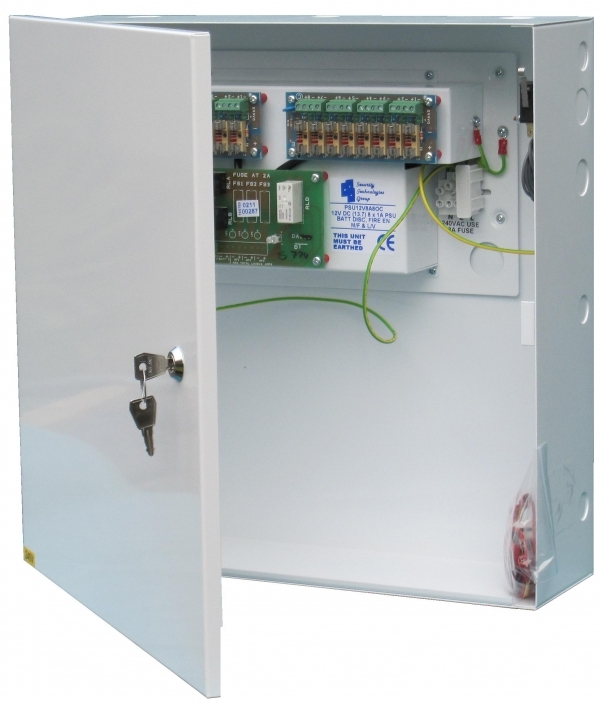 PSUSTG1MB 12Volt @ 8 Amp Power Supply Unit with Battery Back up , hinged lid, tamper switch and lockable enclosure designed specifically for mounting and supplying a variety of Access Control Panels. Description - An 8 Amp 12V (13.7) PSU with 2 separate outputs designed specifically for Access Control applications. This unit has been designed to mount 1 "Mercury Panel”. OEM’s using these panels include: Lenel, Honeywell, RS2 Technologies, Open Options, Keri Systems, Identicard, Arinc, Imron, DvTel, MDI Systems, Synergistics, ID Group, ICX DAQ and Maxxess. Additionally the PSU can be supplied with a blank mounting plate on which can be mounted panels from other manufacturers such as Paxton. The 8 individually fused maintained outputs are used to power the panels, whilst the 8 individually fused switched outputs are used to supply the locks. Output Configuration: 1 x Maintained for powering Access Control Panels and 1 x switched (via fire alarm panel) both through 2 x 8 individually fused outputs. External Dimensions: 420mm x 495mm x 122mm. Description - The PSUBLVI battery low voltage isolator is designed to prevent batteries from deep discharge after prolonged mains failure. The unit is connected between the power supply and the battery. When the battery voltage falls to approximately 9 volts the relay "drops out” and disconnects the battery. After the mains power is restored the power supply output "pull in” the relay and the battery starts to re-charge. Two batteries can be connected to the unit. External Dimensions: 90mm x 50mm x 20mm.